The brand TaxiForSure is now dying a slow death; infact if we leave aside some urban cities, then its almost dead. In a blog post, TaxiForSure announced that they are pulling out of 22 Indian cities, and transferring control to Ola. All accounts of their customers in these cities would be transferred to Ola, and the money would be directed back to the customer’s bank accounts. Paytm wallet associated with their accounts remains untouched, and all promotional credits and offers would be silently transferred to their new Ola account. Ambala, Bhavnagar, Coimbatore, Dehradun, Hubli-Dharwad, Jabalpur, Jamnagar, Jamshedpur, Kochi, Lucknow, Madurai, Mangalore, Patna, Raipur, Ranchi, Sholapur, Tiruchirappalli, Trivandrum, Ujjain, Varanasi, Vijayawada, Visakhapatnam. Operations in urban locations such as New Delhi, Mumbai, Chennai, Kolkata etc would remain same. Recently they announced rides in Hyderabad for Rs 6/km; in Pune & Delhi for Rs 7/kms and Rs 8/km for Mumbai; which almost matches Uber rates. Hence, for time being, it seems brand TaxiForSure will only operate in metropolitan cities and Ola will take over in Tier 2 and 3 cities. Ever since Ola acquired TaxiForSure in March this year, there has been gradual decline: not only in their branding and operations but also in their morale. In May, engineering head Amol Patil & chief technology officer Amitava Ghosh quit the company. 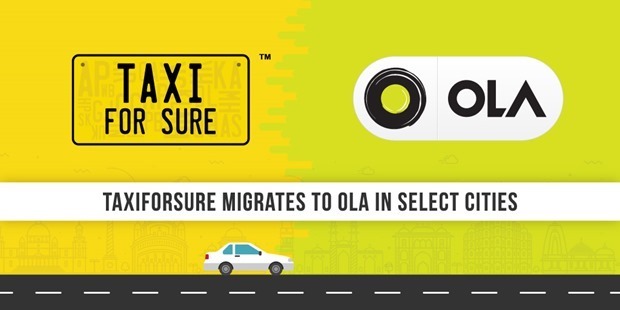 In June, Ola started integrating TaxiForSure booking into their app (for Mumbai and Delhi customers), and allowed their customers to book cabs for both the brands under the app. Such consolidation is a negative one, especially when TaxiForSure is a separate brand, wherein considerable amount of money has been spent to nurture it. The final nail in the coffin was hammered last month, when CEO Arvind Singhal also resigned, citing personal reasons. After the acquisition, it was Arvind who was spearheading the operations, but after his resignation, not much hope remained. At the time of acquisition, all 1700 employees of TaxiForSure were promised that they will continue to operate as a separate entity, but it seems those promises were false. It seems the management of Ola had some different plans for TaxiForSure. "Brand TaxiForSure Almost Dead Now; Shuts Down Operation Across 22 Cities After Ola Integration", 5 out of 5 based on 3 ratings.